THE International Bread Festival is fast approaching. 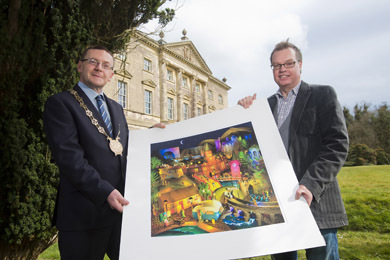 Castle Ward estate and Down District Council are delighted to have local Crossgar artist Keith Drury creating one of his retromagic signature artwork for the advertising campaign which can be seen online and across County Down on Translink buses from Monday 6 May 2013. Keith’s quirky, high definition `retromagic’ style blends together all the elements of the three-day event including the Bread Festival on Saturday 25, Van Morrison Concert on Sunday 26, and the Blues and Bikes Concert on Monday 27 May. Barbara Muhly, Property Manager for National Trust South Down Properties said: “I was looking for an image that would tell the story of the Bread Festival Weekend as it is such an eclectic weekend on offer. This year the three day festival is running across the last bank holiday weekend in May under the theme of Bread, Blues and Bikes. Down District Council Chairman Councillor Mickey Coogan pictured with Crossgar artist Keith Drury who designed the Bread, Blues and Bike advertising poster for the Bread Festival at Castle Ward running from Friday 25 to Monday 28 May. “Keith came to mind as his art is full of vivid colour and is so quirky in nature in the way he combines elements of the past and present- something which Keith calls ‘retromagic’. This felt perfect for what we were trying to show. Keith’s challenge was to blend together the three elements of Bread, Blues and Bikes but also to showcase the fact that Van Morrison would be the headline artist for the Blues Day on Sunday. “The detail of the image says it all… including the unique Strangford Ferry which is detailed in the background! Keith has agreed to include an exhibition of his work as part of the Craft Village which will be in the Farmyard as an integral part of the Bread Festival Weekend. In 2010, Keith was awarded the coveted public commission to create a signature artwork for Belfast City Hall celebrating the Irish history and heritage of the City. This painting is now on permanent public display at Belfast City Hall. Keith has also been involved in art projects with the renowned international author and film maker Don Mullan and recently through this partnership was asked to create a painting of Péle for presentation to him. Keith’s commissioned work has travelled the world with one artwork on ‘Peace’ installed in the church at Messines, Flanders, where Hitler once recuperated from injuries. In 2012 Keith’s art became recognised by a leading London art house who now publish and distribute his work throughout the UK, and his large scale oil paintings which act as social commentaries can be seen on The BBC, UTV as well as being published in The Daily Mail, Irish Times and The Tatler. Speaking at the launch of the International Bread Festival, Keith Drury said: “It was an honour to be asked to create the signature artwork for the International bread festival in the style of the ‘When I dream series’. This style seeks to portray Irish scenes in vibrant colour and high definition detail but with a magical feel so that the viewer is transported into a world of imagination and wonder. “Each canvas is saturated with visual details to be explored and discovered and sometimes a magnifying glass is required to peep in through windows to discover wall paper and light bulbs even inside the buildings. In this Van Morrison artwork, if you can get close enough you will discover that even the Harley Davidson motorbikes have perforated brake discs! The style and subject matter of these artworks aim to remind us that our Irish countryside, cultural heritage and buildings are beautiful places worth preserving and celebrating. “The style is admittedly unusual for it blends a nostalgic period of vintage cars and old shops with street architecture and buildings which have only been recently constructed. It is therefore unashamedly contemporary art for today but yet an art style which manages to celebrate all the things we fondly cherish from yesteryear. For that reason I trust the artwork reflects some of the values of the National Trust as they seek to preserve our natural and built heritage so it can be valued and enjoyed by people from all walks of life today”. The International Bread Festival is on the first of three special days over the Bank Holiday weekend, 25-27 May, there is no admission charge on Saturday 25 May, however a £5/per car conservation charge will be applied for parking to assist in conservation efforts on the Castle Ward site. Tickets for the Van Morrison concert on Sunday 26 May are available from £47 plus booking fee at Belfast Welcome Centre or via Ticketmaster. A range of VIP packages are also available by contacting Castle Ward directly on 028 4488 1204. The Blues & Bikes Concert with the Illegal Eagles and The Wildflowers on Monday 27 May. Normal admission charges apply and everyone is encouraged to bring their bikes to enjoy the trails and open spaces at Castle Ward. The International Bread Festival is part of the Lough Lively Festival which runs from Wednesday 1 May to Monday 3 June 2013. To find out more about the pick up your free programme from Downpatrick Tourist Information Centre or visit www.facebook.com/DownFestivals or visit www.castlewardbreadfestival.com.